The new new Digg has gone live after a change in ownership and a frantic six-week rebuild. 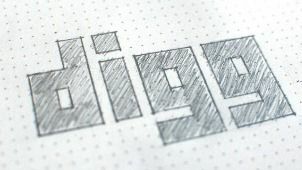 Named Digg v1, the new-look news-sharing site has more than a touch of the Pinterest about it but is still a vast improvement over the tired old design. It's now running on a fresh code base and infrastructure and the new owners promise that "we now have a solid foundation on which to build, and we expect to build fast". Developments slated for imminent launch include more personalisation features, a commenting system, mobile improvements, new features like read-it-later and clearer explanations for why certain stories are trending. Most interestingly, Digg's API will be opened up to outside developers so that they can "can build all the products that we haven't even thought of yet" – let's not mince words here, Digg. Digg v1 takes into account Facebook likes and Twitter shares as well as on-site 'Diggs' – in fact, you'll have to use your Facebook account to sign into Digg for now, which, although temporary, will annoy the anti-social-network crowd. "We believe we can accomplish with ten great engineers and designers what other companies do with a hundred and, by keeping our costs low, take our time to find a business model that does not disrupt or detract from the user experience."